Brewery Insurance Risk Management- Beall Brewery Ins. Beall Brewery Insurance Risk Management offers a competitive advantage that few brewery insurance programs can match. We are committed to providing outstanding value-added services to not only large craft brewers but also to those small and medium-sized craft brewers that others may ignore. 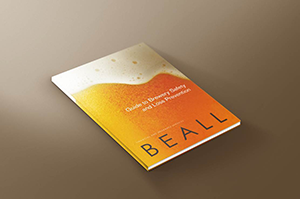 An example of one of our value-added services is our Beall Brewery Insurance Guide to Brewery Safety and Loss Prevention, which covers the property hazards, employee hazards, and liability hazards that face every craft brewery and brewpub. In this book we cover everything from protecting brewery equipment and the delicious end product, to protecting employees and customers, to reducing liquor liability issues. We even include a spectrum of brewery insurance risk management safety checklists. We understand brewery insurance risk management, and our book is a concise guide to help craft brewery staff and management ensure the safety of all the people that come onto the premises–and the security of the brewery itself for years to come. Professional ongoing account service focused on measurable goals and meaningful outcomes.